At New York we didn't see a new Mazda Miata—well, not all of it, anyway. But we did see a the 25th Anniversary Edition: a paint and interior send-off to the NC platform with its own requisite headrest logos and numbered plaques. It comes in an exclusive Soul Red with Almond (read: tan) seats. Its engine components are individually weighed and selected by magical elves in Hiroshima. It has Bilstein shocks and aluminum pedals and will be essentially built to order. Just 100 cars were to come to America, out of a total of 1,000 worldwide. Preordering opened up at Mazda's website at 10:25am this morning, Pacific time. Ten minutes later, all 100 were sold. 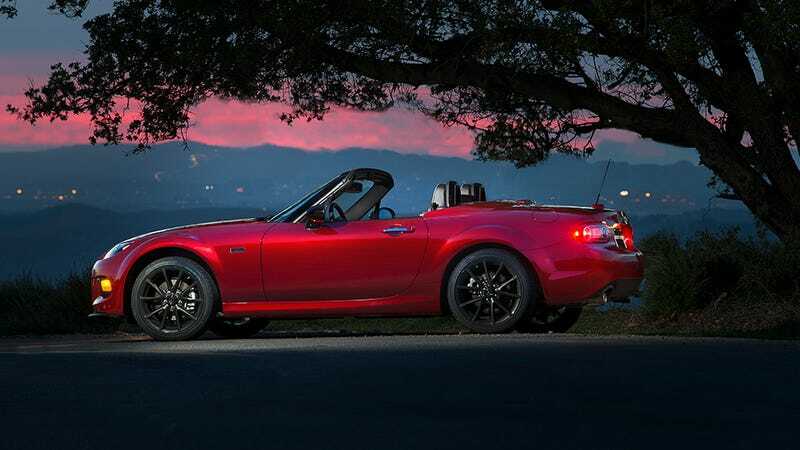 "THE MX-5 25TH ANNIVERSARY EDITIONS WENT FAST... VERY FAST," says the Mazda website where you could have preordered the car, had you been faster with your mouse-clicking finger. It's proof that Miata people don't mess around. It's like buying tickets to the Stone Roses or something. If you thought a bid on the most expensive Miata you can buy (at $32,205) was going to be a leisurely process—maybe a few days to mull it over, to decide whether or not you'd make that investment—then nope: this is Neiman Marcus territory here. If you want one now, you'll have to scour the used-car ads and CarMax lots for your dream Miata...or, alternatively, may we interest you in a 10th Anniversary? Turn back the clock a little, and if you're lucky you can even get His And Her Seiko watches. "I thought it was going to go quickly, but honestly not THAT quickly!" said Jeremy Barnes, Mazda's Director of Communications and 787 pilot extraordinaire. "Proves this Anniversary Edition car was the real deal, and proves that the car's as loved 25 years and 940k cars later, as it was on day one." Mazda had budgeted for up to 250 customer inquiries, or it would have opened the preordering until May 31st, whichever filled up first. Now, they won't have to.